The heroes of your favorite cartoon are back again and seems like they are in trouble. Help them to escape the asteroid belt and reach the other side of the screen. 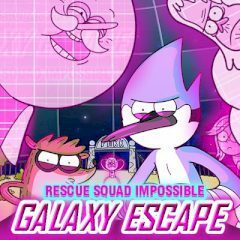 The heroes of Regular Show are in trouble somewhere deep in the space! Can you help them? the only way to get out of this narrow asteroid belt is to blow the asteroids that block the way. Find your partner first and then shoot asteroid on your way, collecting useful consumables and health kits.